This post has already been read 8622 times! A few weeks ago I had the pleasure to attend a great meeting with Scale Computing at Virtualization Field Day 4 in Austin, Texas. I had met Jason Collier (@bocanuts) before at Tech Field Day Extra at VMworld US 2012. Jason has managed to build Scale Computing HC3 System into a real mature product in the last 2.5 years. There are three models – the HC1000, HC2000, HC4000 – that support anywhere from 3 quad core to 6 hex core CPUs, from 96GB to 384GB DRAM and from 6 to 28.8TB raw storage per box. Scale uses QEMU which provides a storage pathing component that directly connects to the KVM kernel. They have created their own distribution based on RHEL and, along with SCRIBE, have eliminated storage protocols. Scale Computing has also built an orchestration stack to control all of the components. For now, that means no exposed APIs or CLI commands for the IT admin. This is to keep the integrity of the product and to fully support the complete stack. Scale Computing’s runs a great HTML5 Web UI on every HC3-node. (no management server!) The VM creation workflow has improved a lot. Users can now combine VMs into logical groups via tagging and set multiple tags for easy filtering via spotlight search functionality that matches names and descriptions for quick access in larger environments. Snapshot, cloning and replication functionality are now integrated into the card view of each VM for easy administration. 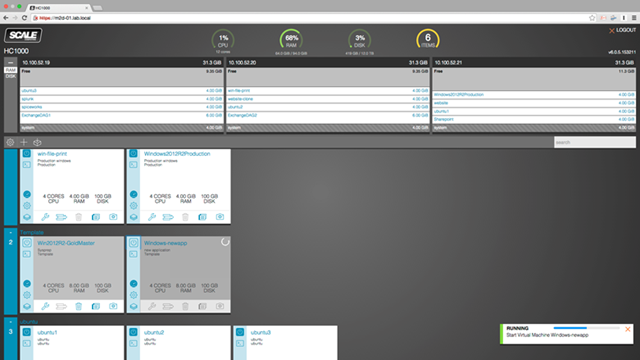 Scale Computing latest HC6 release features built-in Remote Disaster Recovery to allow users to set up continuous replication on a VM by VM basis between two HC3 clusters with space-efficient snapshot technology replicating to a secondary site, tracking only the blocks unique to each manual or automatic snapshot and sending the changed blocks. Testing a DR infrastructure plan is now as simple as cloning a snapshot on the target cluster and starting a VM with no disruption to ongoing replication. In case of disaster, users can simply “clone” a snapshot on the target cluster for the manual failover of a VM that is immediately bootable or simply replicate changed data at a DR site back to the primary site for simple failback. SCRIBE is Scale’s Storage Layer that aggregates all block storage into a single pool of storage resources that mirrors all the data chunks for performance, redundancy and fast rebuilds. It’s best to watch this very informative deep dive #SFD5 Presentation into SCRIBE. Scale Computing integrates storage, servers, and virtualization software into an all-in-one appliance based system that is scalable, self-healing and as easy to manage as a single server. Using industry standard components, the HC3 appliances install in under an hour, and can be expanded and upgraded with no downtime. Scale has created a great system that’s very easy to manage by SMB administrators, surrounded by a new intuitive design and Web GUI. This is critical for the SME, since the ‘server guy’ of these companies is also usually the ‘storage guy,’ the ‘network guy’ and the ‘desktop/laptop guy.’ Workflows allow an administrator to be guided through whatever virtualization task is needed and get back to doing other things, like troubleshooting the network or providing desktop support. Go and watch the videos from their presentation here. Hm – it seems some people are having trouble with the link even though I can’t reproduce the problem (you’re the 2nd person who told me that). In mean time, you might try going straight to http://www.scalecomputing.com and if the green price quote like (top right) also gives you trouble, you can click live chat and we’ll give you some pricing help that way. Thanks for covering us in this post! For those interested, an HC3 pricing wizard is available here: http://s87.eu/scale-hc3-pricing – We also can answer questions or provide on-demand demos via the live chat button on the website.